NAY PYI TAW (Myanmar Now) – Myanmar’s new parliament nominated four presidential candidates on Thursday, with Htin Kyaw, a nominee from the National League for Democracy (NLD), tipped to be president. One name was notably absent – Nobel peace laureate and NLD leader Aung San Suu Kyi who did not attend the event. Despite a landslide election victory for the NLD, the widely popular Suu Kyi is barred from the presidency by a clause in the constitution that disqualifies those with spouses or children of foreign nationality – her late husband was British and her two sons carry British passports. Suu Kyi has publicly said, however, that she would rule “above the president”. Even without Suu Kyi on the ballot, the nominations are a historic moment for this impoverished Southeast Asian nation. It heralds the first genuine civilian government, and a democratically-elected one, for the 51-million citizens since the military coup in 1962. The final vote to determine who will be president is expected next week. Unlike the opening of the parliament on Feb. 1, however, the atmosphere was more of caution and discretion rather than exuberance. According to a senior NLD official, Suu Kyi is expected to take the position of foreign minister in the new cabinet. The position would qualify her to be on the powerful, 11-member National Security and Defense Council that makes key security decisions for the country. The two NLD nominees are Suu Kyi’s loyal aide Htin Kyaw and Chin politician Henry Van Thio. Also nominated are former vice-president Sai Mauk Kham and former speaker of the upper house Khin Aung Myint, from the outgoing Union Solidarity and Development Party (USDP), which is seen as aligned with the military. The military bloc, which has 25 percent reserved seats, has yet to announce its nominee(s). With the NLD holding a majority of parliamentary seats, the party is all but assured of winning the presidency. If his nomination survives an upcoming vetting process, it is near certain that 69-year-old Htin Kyaw will take the role as titular head of state and proxy for his old friend Suu Kyi, becoming the first non-military man in the highest office for more than half a century. A vote is expected to take place in a few days, following the process of vetting. Two of the losing candidates will become vice-presidents. Htin Kyaw has an impeccable pedigree and family connections. The computer science graduate from the University of London is the son of late poet and author Min Thu Wun, a highly-respected literary figure in the country and an NLD MP-elect for Kamayut Township in the 1990 elections, the results of which were ignored by the military. Htin Kyaw himself is not an MP but has been a close aide of Suu Kyi since her days of house arrest in the military era. He is currently a senior executive in Daw Khin Kyi foundation, Suu Kyi’s charity named after her mother. His wife, Suu Suu Lwin, is a two-time NLD MP. She won in the 2012 by-elections and also in the general elections last year. Her late father, U Lwin, is one of the founding members of the party. “U Htin Kyaw is a man of personal integrity. He has assisted Daw Aung San Suu Kyi all along. 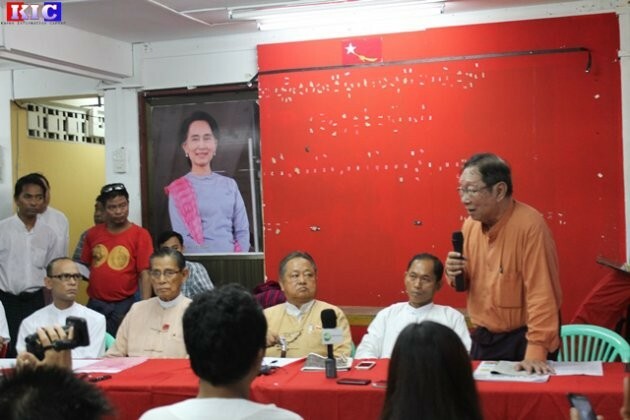 More importantly, he would willingly cede his position in the event of a constitutional change which would allow for Daw Aung San Suu Kyi’s presidency,” said Ba Myo Thein, an upper house NLD MP from Yangon who was chosen today to be one of the seven-member presidential college that will vet the nominees. Party lawmakers, aware of the precarious relation between the army and its erstwhile nemesis Suu Kyi, are reconciled to the fact that she will not become the official head of state, at least immediately. Win Zaw, another NLD MP from the town of Hopin in Kachin State, said the party leadership’s decision to appoint a proxy president is the right one since there were no other alternatives following the apparently unsuccessful “national reconciliation” talks between Suu Kyi and the army chief Min Aung Hlaing. Amid the excitement, daunting challenges lie ahead for the new government. These include resolving longstanding ethnic conflicts and building trust with the military leaders who control three key ministries of defense, home affairs and border affairs. In the coming days, a parliamentary committee will scrutinise the candidates to determine whether they meet the qualifications outlined in the army-drafted constitution which states that the president of the country must be acquainted with military affairs and not be subject of a foreign power. Htin Kyaw’s lack of military experience may draw some resistance to his nomination from the powerful army. After the popular vote in both chambers of parliament electing the president, the formal transfer of power will take place on March 30 in the grandiose parliament in the remote capital Naypyidaw. The current President Thein Sein, who came into power in 2011 and initiated a series of political and economic reforms, will not attend the swearing-in ceremony of the new president but will be present at the dinner at the presidential house in Naypyidaw, according to NLD party officials. *This article first appeared on Myanmar Now on 10/3/2016.